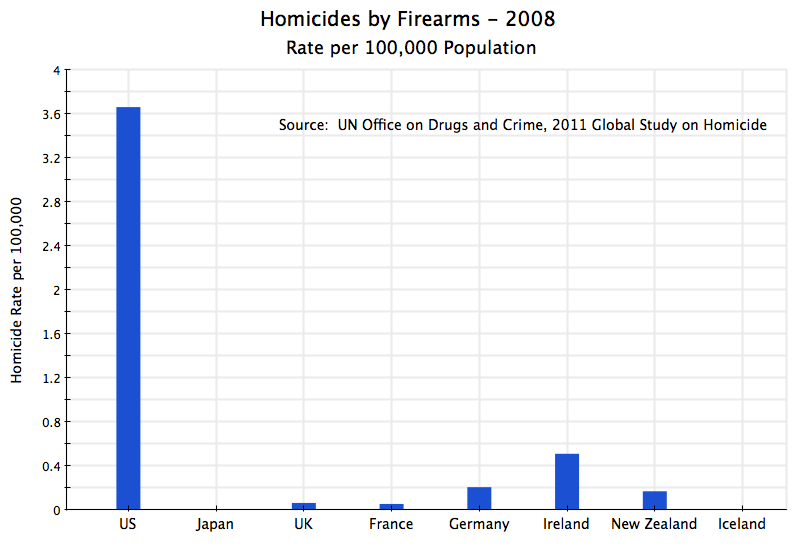 It is well known that the rate of homicides due to firearms is higher in the US than in other developed countries. What some might not realize is how much higher. But some then argue that while the US rate of homicides by firearms might be high, homicides can be carried out by other weapons, such as knives and clubs, and that when one takes these into account, the overall homicide rates are similar. This is simply not true. Some also argue that the US suffers from especially high criminality for social, cultural, economic, or whatever reasons, and that homicide rates in the US are just similarly high. This is also simply not true. This blog post will examine these assertions through a series of simple charts. Japan, the UK, France, and Germany were chosen as other large, developed, countries with per capita incomes comparable to that of the US. All are members of the OECD, the “club” of developed countries that, among other activities, share data and analyses. Ireland, New Zealand, and Iceland (also OECD members) were added for reasons that will become clear below. Briefly, these three countries plus the UK had the highest rates of overall criminality among the 26 OECD members, which make them interesting comparators. As the chart above shows, homicides by firearms are tiny in the comparator countries relative to what they are in the US. The US rate in 2008 was over 3.6 homicides per 100,000 population. As was noted in a previous posting on this blog, this rate had come down by almost half during the 1990s. But a 3.6 rate pales in comparison to rates of only 0.009 in Japan, 0.06 in the UK and France, 0.2 in Germany, 0.5 in Ireland, 0.2 in New Zealand, and exactly zero in Iceland (where there no homicides at all in 2008). Put another way, the rate in the US was 424 times higher than it was in Japan, and about 60 times higher than in the UK and France. The overall US homicide rate of about 5.5 still remains far above the rates of between 0.5 and 1.3 in the other countries (and of exactly zero in Iceland). Here the rates are at least comparable to each other. While the US rate remains the highest, at a rate of 1.8 per 100,000, the rates for the others are between 0.5 and about 1.25 (other than the rate of zero for Iceland). But there is no basis for the argument made by some gun advocates in the US that if one restricted access to guns, that the homicides would take place anyway, but by means of knives and clubs and other weapons. One does not see this in the other countries. Firearms are not substituting for other weapons in the homicide rate. The data rather are consistent with firearms adding to the rate of homicides by other methods, leading to a very high overall rate for the US. The number of victims of crimes in the US (as a share of the population) is in the middle of the range for this set of comparator countries. In the US, about 17.5% of the population had been the victim of a crime (burglary, theft, robbery, sexual assault, other assault or threatened assault) over the preceding 12 months. The rates were between 10 and 13% in Japan, France, and Germany, but between 21 and 22% in the UK, Ireland, New Zealand, and Iceland. These latter four countries had the highest rates of any countries in the sample of 26 OECD countries with data. The overall OECD average was 15.5%. The US rate ranked #17 of the 26 countries. 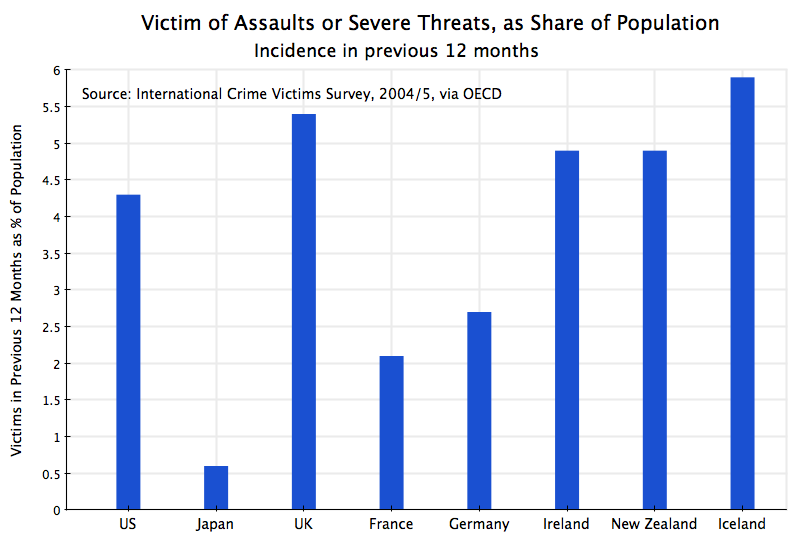 Criminality in the US, in terms of the number of victims as a share of the population, is therefore somewhat above the OECD average, but is by no means the highest. Nine of the 26 OECD countries were worse. The four worst countries were the UK, Ireland, New Zealand, and Iceland. But as seen in the chart at the top of this post, their rates of homicide by firearms are tiny compared to the rate in the US. Relatively higher rates of criminality are not associated with higher rates of homicides by firearms. The same holds true for homicides by any method. The US rate of 4.3% is again by no means the highest rate among the OECD members. The UK, Ireland, New Zealand, and Iceland again all have higher rates (of 4.9 to 5.9%). These latter four countries are again the worst four among the 26 OECD members. 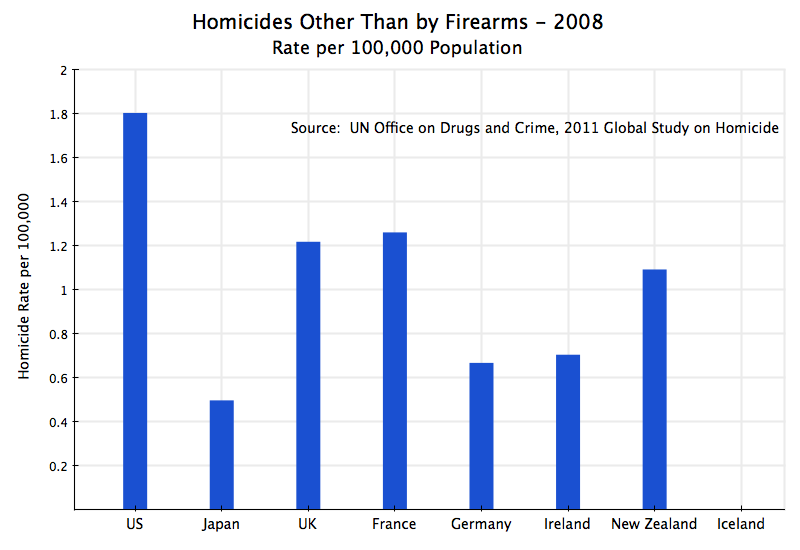 The US rate of assault is well within the range for the OECD countries, yet its homicide rate by firearms is far higher. 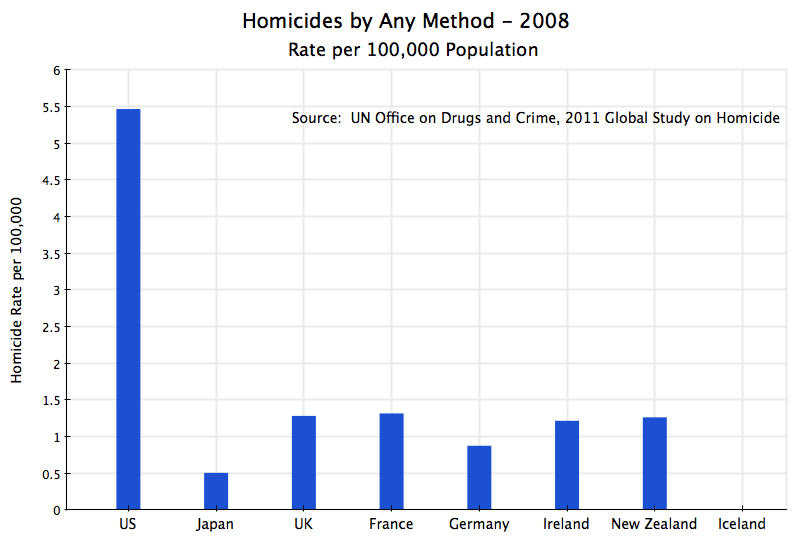 And countries with higher rates of assault have far lower rates of homicide. To conclude, the rate of homicides in the US by firearms is incredibly higher than the rate seen in other OECD countries. This cannot be explained by a substitution of firearms for other weapons which would have been used anyway to commit the homicide, nor can it be explained by an especially high rate of criminality in the US. 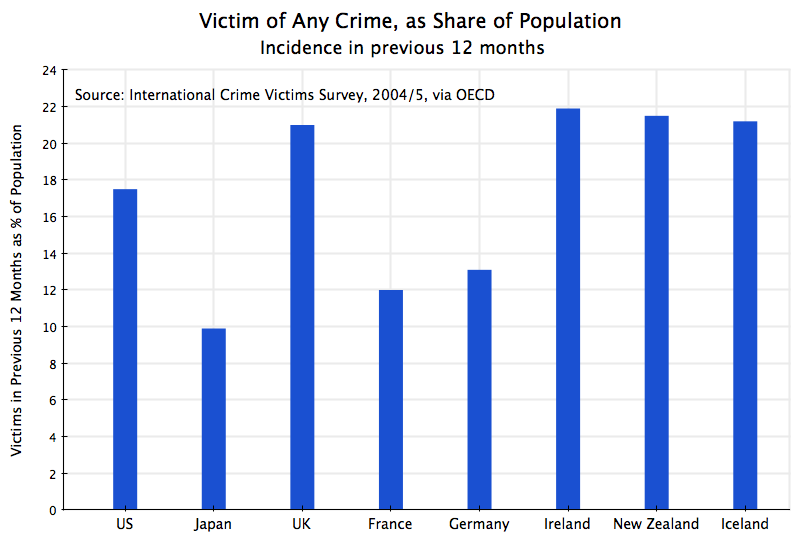 There are more victims of crimes as a share of the population in other OECD countries, who nevertheless have far lower homicide rates. The easy availability of firearms in the US, instead of the tight controls seen in other developed countries, certainly has something to do with this. This entry was posted in More Political than Economic and tagged gun control, US politics by aneconomicsense. Bookmark the permalink.